Stacking C3 tri banders with a StackMatch and Dual Feed Option to maximize flexibility! I want to again thank you for your last minute efforts in getting out our order prior to the CQWW cw contest. My station is located 1/2 mile north of the Great South Bay on the south shore of Long Island. 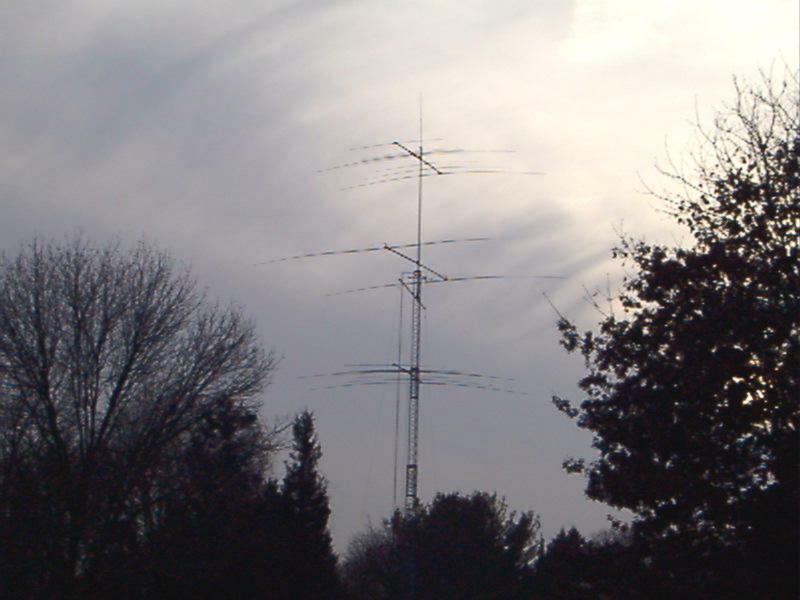 I have a pair of Force 12 C3e's at 90 and 54 feet, Between the two tribanders is a Force 12 240x. I have the new Stackmatch feeding the tribanders with the dual option feed. The tower in this picture is a LM470d. In this years CQWW CW test we went 2 man M/S using the call W2AA. The end result was way beyond our expectations. 3262 q's 188 z's 634 c's for 7,785,984 points claimed. The diversity of your products accounted for us being able to really have fun! This station also placed 1st USA in the 1998 ARRL ssb contest. I operated in the single op assisted category during this one and ended up with 2.9 million points. I appreciate your products and can't wait to place an order for a dozen Stack boxes!